Uniquely designed by UK’s Norr Architects, our intimate Hoi An resort is acclaimed as the Best Value for Money Resort in the region. Once you arrive, you may never want to leave, and so we’ve ensured you can enjoy your meals and our array of premium services without giving second thought to affordability. The countless international and national awards won by our Team will give true justice to our slogan Heartfelt Hospitality – Lasting Impressions. Hours of Operation:Beverage Service: 10.00 – 22.00, daily. Food Service: 11.00 – 21.30, daily. Happy Hour 17:00 – 19:00, daily. The Pool House brings a refreshing poolside dining experience in an elegant, but laid back environment complete with a stunning view of Cham Island. In a tasteful Mediterranean – inspired settings, our master chef offers a wide selection of Western & Vietnamese delicacies with a modern twist. Private dining and candlelit dinners on the beach are available on request. Please ask for more information with our Restaurant Team. Not wanting to leave the cool breeze by our refreshing pools, The Pool House serves you poolside snacks, pizzas, sandwiches and burgers, as well as premium ice-cream and will add up during dinner a special dinner menu. Hours of Operation:Breakfast 6.30 am- 10.30 am, daily. Dinner 18.00 – 22.00, daily. Spice Garden Restaurant satisfies diners with its freshly prepared cuisine made from wholesome ingredients and fresh Vietnamese herbs. 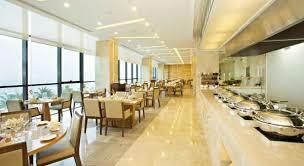 Guests can start the day with an extensive buffet of international breakfast treats, and end the day with an interactive personal cooking experience with our wok kitchen or Hot Rock dining: the super-heatedstones are delivered to your table enabling you to prepare your meal to your taste. This healthy culinary experience locks in the nutrients and natural juices, using no oil and eliminating fat. Just sit back and enjoy this culinary journey. Hours of Operation:Available 24 hours, daily. In-room dining at Sunrise Premium Resort Hoi An is available 24-hours a day. Perfect for early risers, a private dinner for two, late night meals or for a small gathering. Relax in the comfort and privacy of your room or villa, and choose from an extensive selection of hearty comfort food, tasty light meals and signature gourmet dishes. The stylish Deluxe Rooms with its floor-to-ceiling-windows were designed with comfort, peace and privacy in mind. The balconies have been completely enclosed which allow you to either sit with a open window enjoying the breeze or during the wet weathers offers you a private escape with comfortable loungers to relax, read a book or simply enjoy the marvels of our gardens and in our Ocean Deluxe Rooms the sprawling views over Cham Island. Located from the Ground Floor to the 3rd floor of our resort, the spacious 85 m2 Sunrise Suite features a spacious living room and separate bedroom with deep-soaking bathtub, positioning Sunrise as one of the best resorts in Vietnam for families. Ideal for family beach holidays, a number of our Suites are configured as Family Suites which are connected to a 2nd bedroom. The Suite can conveniently hold one extra bed in either the Living room or Bedroom as per your liking. 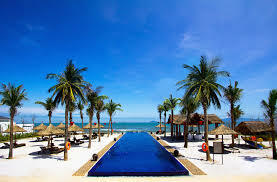 If you are looking for the ideal Vietnam resort with private pool, look no further. Bright, elegant and ultra-comfortable, the One-Bedroom Villas are hailed as the perfect private retreat. For guests who have always wanted the seclusion of a private beach villa, while still having unrivaled access to all amenities of a 5-star luxury beach resort, the Two-Bedroom Ocean front Villa is the perfect choice. The Hoi An holiday villa boasts the authentic feeling of home throughout its lavishly designed space including a master bedroom and twin bedroom, living room, outdoor terrace and balcony. Featuring an outdoor bamboo rain-shower and a custom designed bathtub, along with state-of-the-art technology which includes a central control to personalize your room temperature. A breathtaking sunrise view of the East Sea in unparalleled 21st century luxury, our stunning Grand Villa is the finest space Sunrise Premium Resort Hoi An has to offer. This luxury Hoi An beach accommodation has two large king beds, a daybed sofa and relaxing chairs. The villa’s open kitchen, dining area, terrace and balcony offer the perfect location for exclusive dining and relaxation. In addition to a private pool, custom designed bathtub and walk-in rain shower, The Grand Villas are conveniently located to enjoy our world-class facilities. VIEW MORE: "Hotels in Hoi An"